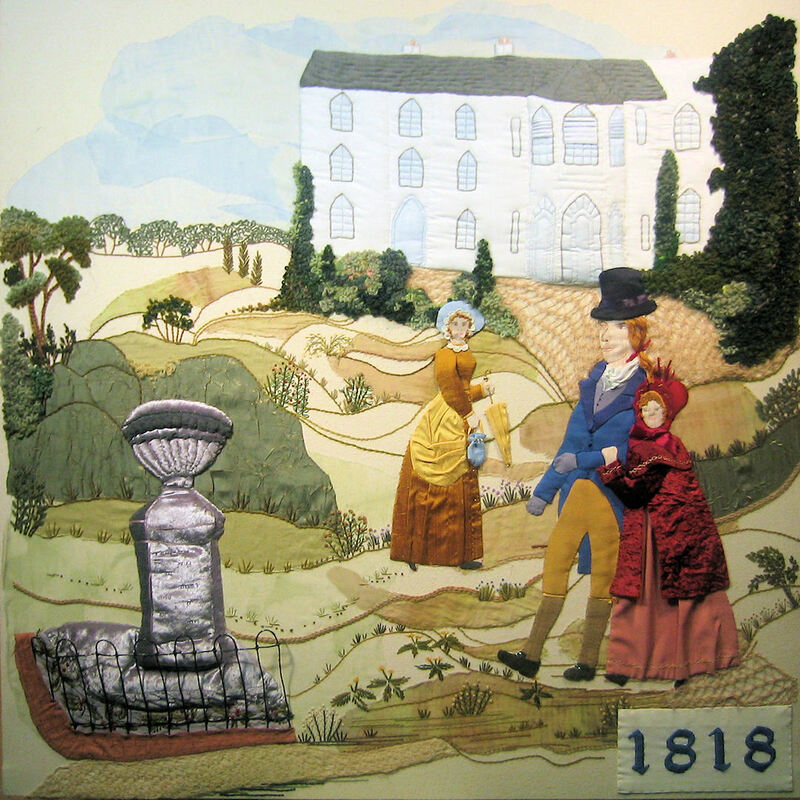 The Southam Embroideries are on permanent display at The Grange Hall. Viewing is by appointment. 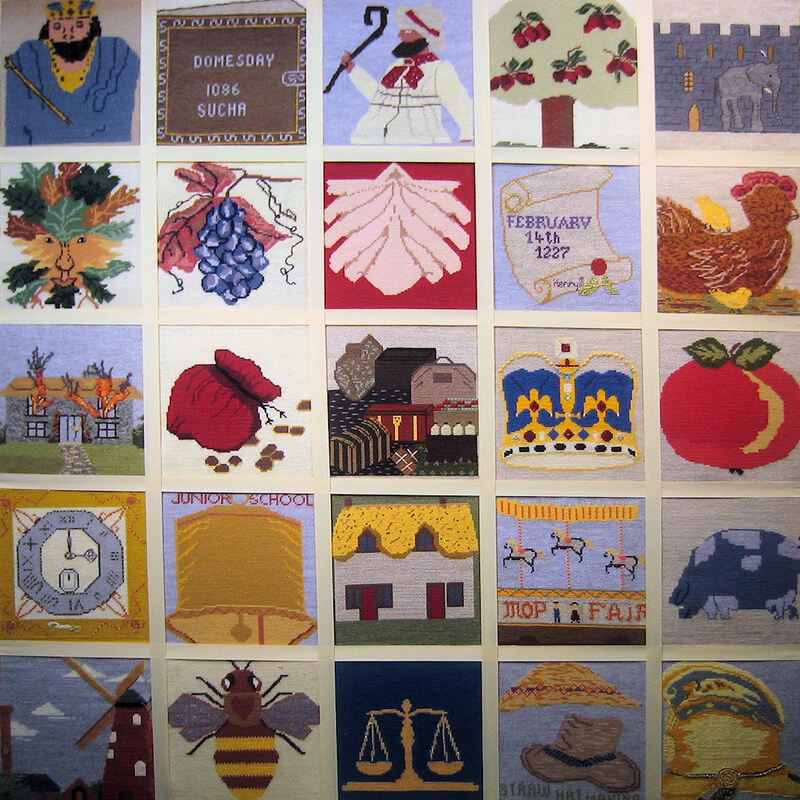 The Embroideries depict the history of Southam from 998 to 1902. They consist of five panels four feet square (1.22m) plus another panel with 25 cross stitched designs; and a smaller panel of the Southam crest. It all started in February 2001. The idea came from Mary Rock, who while sitting in the Grange Hall, thought how bare the walls looked, and came up with the idea. Not being able to embroider or cross-stitch herself, she placed an article in the Southam Advertiser, to which 23 ladies met soon after and a small committee was formed. After framing and glazing, the completed works went on display in The Grange Hall on 17 October 2003. The panel illustrates the beginning of the Southam story. 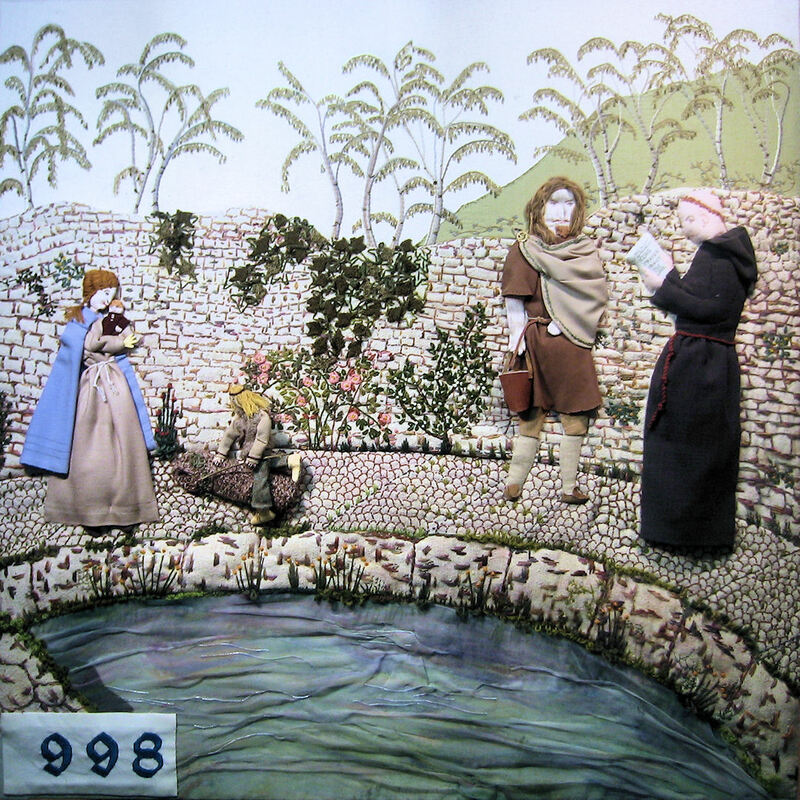 The Holywell was a place where local inhabitants went to draw water. It shows a monk reading to a Saxon man and his family from the Charter of 998, when King Ethelred the Unready gave Suham (Southam) to Leofwyne, father of Leofric (husband of Lady Godiva). This charter is preserved in the Bodleian Library in Oxford. The water was created by using fabric crayons on transparent fabric: the fabric was then worked to give the appearance of water. The wall was embroidered with woollen threads and coloured with fabric crayons. The figures were worked separately and applied to the panel. Many different embroidery stitches were used for the trees, foliage and foreground, knitting and crochet were also used. People involved: Liz King, Hazel Preston, Margaret Ray, Marion Randall, Cynthia Kirkham, Mary Kenlock, Val Steele. The second panel portrays a medieval market around the 13th century. Southam was becoming a busy place. Villages built their houses from resources around them: trees, clay, straw, cow manure, pebbles. They would have made all their own clothes, buying fabric from merchants who had stalls on market day. Other stalls would have held coal, fish, meat, poultry, spices salt, baskets, pots and pans. Henry 3rd granted a charter on February 14th 1227, giving Southam ‘town’ status, which gave the town freedom within the feudal system. 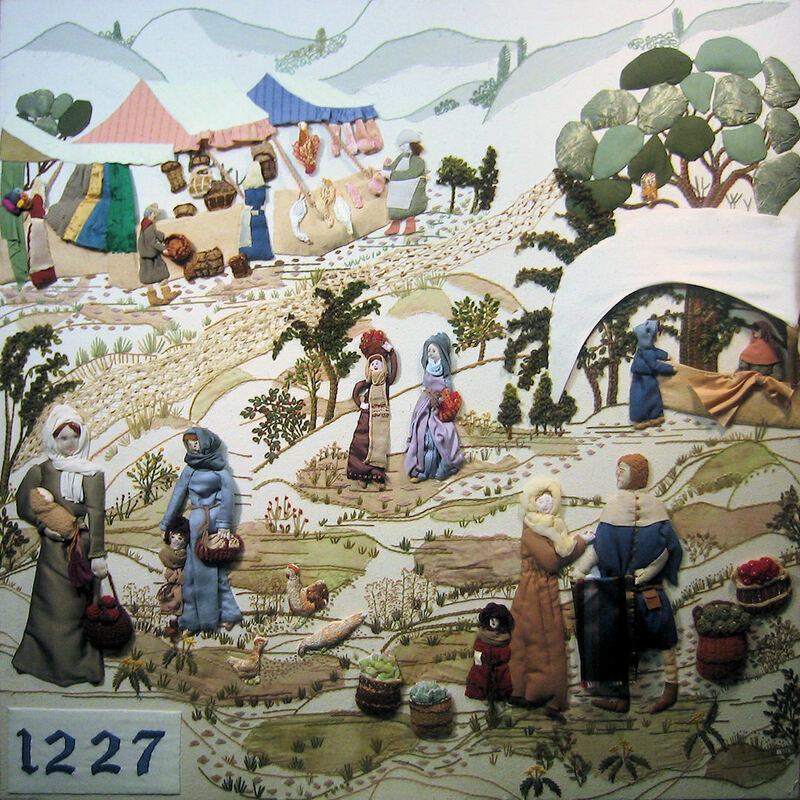 The techniques used were many and varied, they included appliqué, fabric painting and knitting for the path (left into the distance middle). People involved: Liz King, Hazel Preston, Margaret Ray, Marion Randall, Cynthia Kirkham, Mary Kenlock, Val Steele, Mary Rock, Maria Spence, Maggie Rowlett. The third panel portrays the part which Southam played in the Civil war. It shows a scene outside The Old Mint Pub, where Charles 1st coins allegedly had coins minted to pay his troops. Our small town harboured 13,000 troops from both the Royalists and Parliamentarians, some in the town; others camped in the surrounding fields. Southam was also noted for its cider which was sold in the Drury Lane theatre until 1830. The Old Mint pub was a textured fabric, which was painted with fabric paints and then hand quilted. The figures were worked separately and padded to give them a more lifelike form. Fields were added to the background fabric using transparent fabric which was cold dyed to various shades. Different embroidery stitches were used to make the trees and hedges. The cart was made out of 4 different fabrics. Many embroidery stitches and techniques were used to achieve all the foliage details. The fourth panel shows people attending the local Infirmary, built by Southam born Dr. Henry Lilley Smith. It opened in spring 1818. Medical advice, professional attendance and medicine were free. It was supported by voluntary subscriptions from the wealthy people of the town. Water from the Holywell was reputedly used to heal the eyes of patients. Dr Lilley-Smith also arranged the first May day Fete with rural sports. He also built a Dispensary which flourished during his lifetime but ended with his death in 1859. The stone monument shown on this panel was erected near the site of the Dispensary to the memory of the doctor. Quilting and shadow quilting were used to create the hospital building on a soft white fabric. Similar techniques were used to for the 3 figures. The trepunto method was used on the monument. Gauze fabrics were cold dyed for the sky, fields and paths with various methods of embroidery, using many shades of 2 ply wool. For the hedges, trees and knitted path many shades of embroidery silk and wool were used. 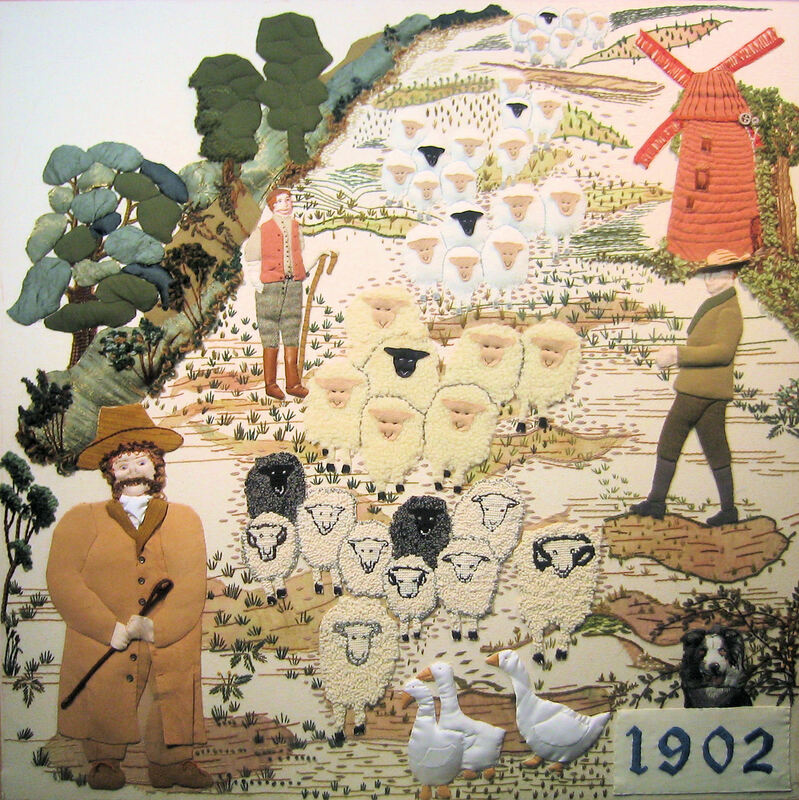 The fifth panel portrays the Welsh Drovers and their dog, which for centuries drove sheep, cattle and geese through Southam to markets in the Eastern Counties and London. The drovers ate, drank and slept in one of the 20 pubs/hostelries that were in the town at this time. The windmill was built in 1834; it was four storeys high with patent sails and 3 pairs of stones. A family of millers and bakers worked the mill until 1947 when another family took over. The mill was totally dismantled in the mid 1970s. 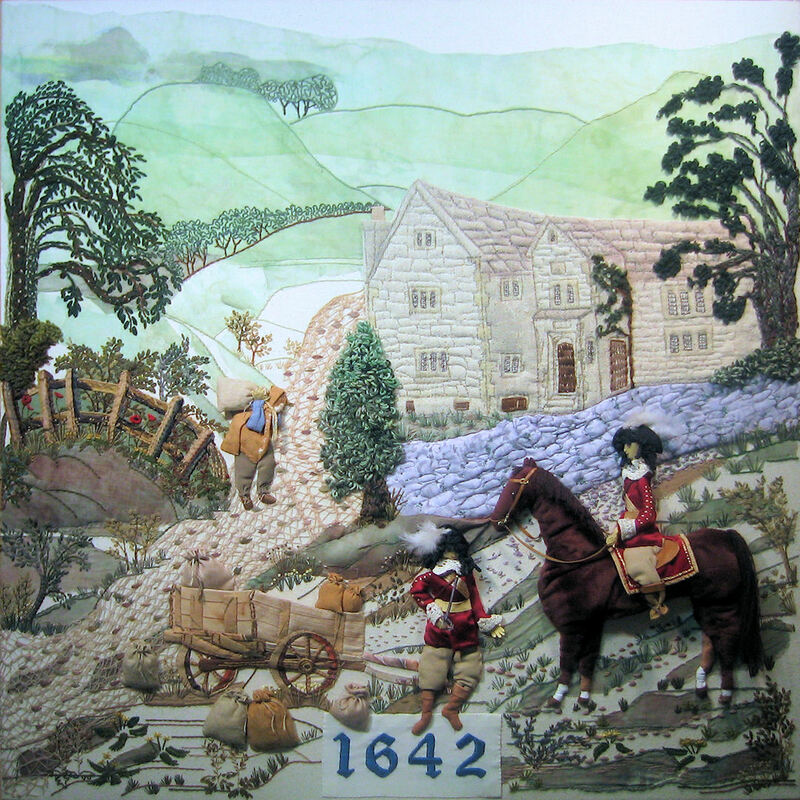 Various techniques were used in creating this panel, including appliqué, quilting, shadow quilting and cross stitch. Dyeing with tea bags was perfected to help coordinate the various shades of brown and beige needed for the drover and the paths. Three techniques were used for the sheep. A range of embroidery stitches were used for the trees, hedges and background. People involved: Hazel Preston, Margaret Ray, Maria Spence, Angie Bull, Betty Mitchelmore, Liz King, Cynthia Kirkham, Mary Kenlock, Val Steele. Saxon King – First charter 998 Ethelred the Unready. Doomsday Survey – 3. Hiring Fair. Damson tree – Warwickshire Drooper. 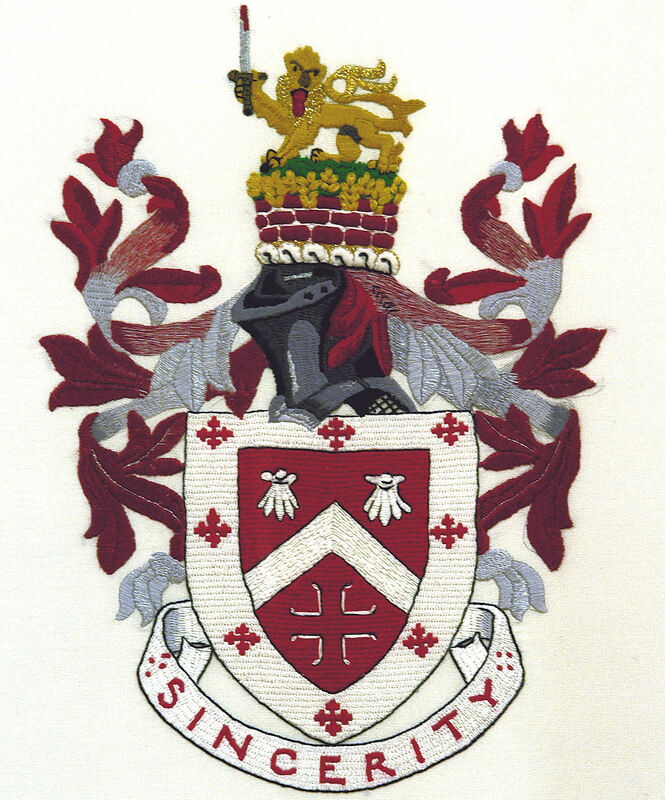 Elephant & Castle – Coventry Crest, Priors of Coventry were Lords of the Manor of Southam. Grapes – vines owned by Prior of Coventry. Escallop – Emblem of St.James Patron Saint of Southam. Royal Charter – Granted to Southam February 1227. Pouch & Coins – Coins were minted in the town 1642. Luggage – First Stage coach (London to Chester). Crown – 6th Century farmhouse turned into a Public House. Apple – Cider produced in Southam and sold at Drury Lane Theatre. Clock -Famous clock maker Charles Oldham worked in the town. School bell – Symbol of Trust School established 1760. Dispensary cottage built early 1820s. Mop Fair – Hiring fair became more of a day out for residents of Southam. Blue Pig – Main meeting place for carriers passing through Southam. Windmill – millers and bakers lived and worked there. Beeswing – Long standing Public House from 1824. Scales of Justice – Magistrates court built in 1865. Bonnet & Hat – Straw hats made in the town during this period. Fireman’s helmet – Fire station established 1812. Stitchers: Diane Sansome-Smith, Angie Bull, Margaret Ray, Angela Bliss, Joan Price, Betty Mitchelmore, Carole Gwillam, Val Steele Maria Spence, Lorna Russell, Sylvia Lee, Glesni Thomas, Mary Hughes, Mary Kenlock, Jean Pownall, Dorothy Warner. This panel was embroidered by Sylvia Lee and it took her six months to complete. It is worked mainly in satin stitch in gold and silk threads. Other stitches were also used to great effect with some padded work also being undertaken.